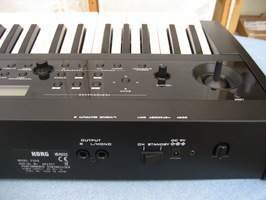 PS60 Performance Synthesizer, Digital Synth from Korg. "Hey, let me know when you are done turning knobs and playing with your touchscreen so you can finally give us some Rhodes and finish your synth solo!" - OK, I'm ready. Three, four, dzoiiiiiiing!!! - What's that chord you're playing? Don't you know "All by myself" is in A sharp? 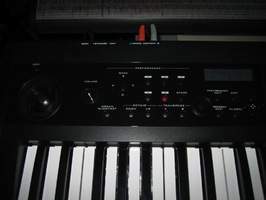 Many keyboard players have experienced this when they still don't master their brand new workstations yet, in spite of several weeks dedicated to getting to know their instrument. Complexity overcomes spontaneity! But what options do we have left, except for stacking several synths to have everything at our fingertips and edit splits and layers faster than Keith Emerson can play a fill over a five-octave keyboard or Jim Morrison can drink five bourbons... 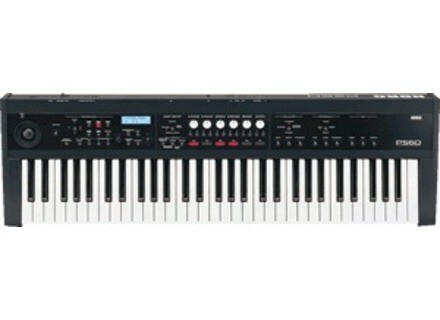 The Korg PS60 aims to be the answer: compact, quick, affordable, fully packed with ready-to-use sounds, and very editable. Let's see if it holds true! 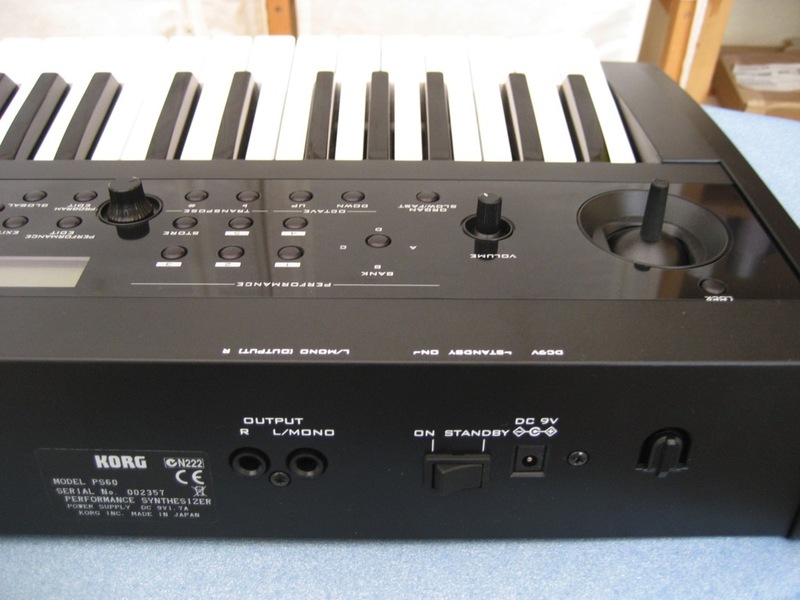 The PS60 is a very compact five-octave keyboard with the Korg-typical pitchbend/modulation joystick placed above the keys. Not very long nor heavy at all, due to the fact that it's made out of plastic with a very nice and glossy finish. On the other hand, you'll have to protect the device to take it on the road because it's no tank... On the front panel there are many controls spread over a quite unusual layout. 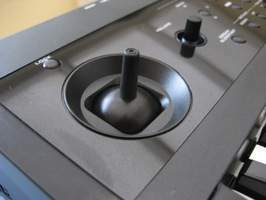 From left to right, you'll find the joystick with a Hold key that allows you to hold the value corresponding to its position on the modulation axis, i.e. you can lock the return spring that brings the joystick back to the center position. You'll also find a volume control and a key dedicated to Leslie simulations for organ sounds. But it has a fixed assignation... There's also a row of keys for octave and half-tone transposition. Well done! Just above that, you'll find a control section to store/recall performances pushing only one or two buttons. 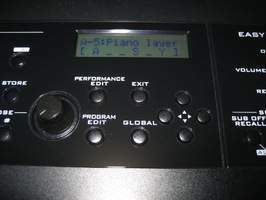 In the middle, a small 2x16 character, gray-blue LCD is placed above the selection keys for mode and performance selection. But the most original section is clearly the control field's right section. 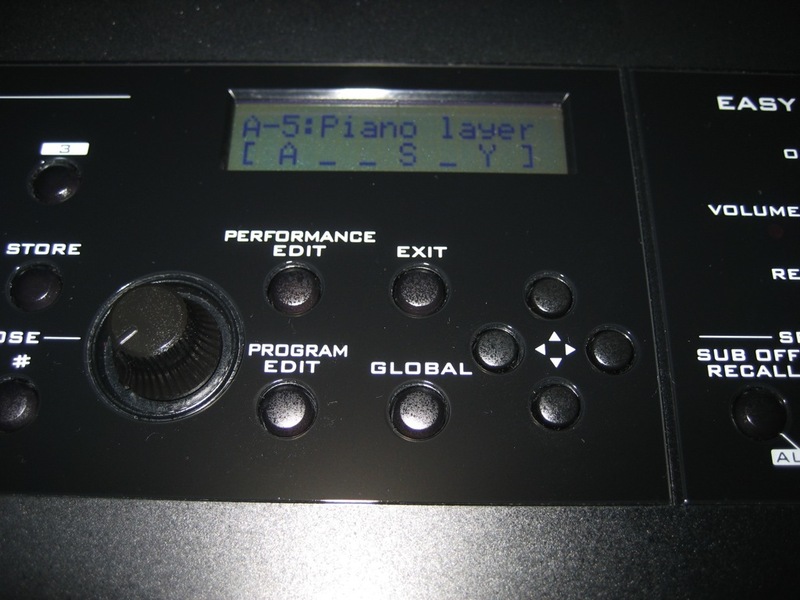 It allows you to select, turn on/off and mix on the fly two sets of six separate sound layers. 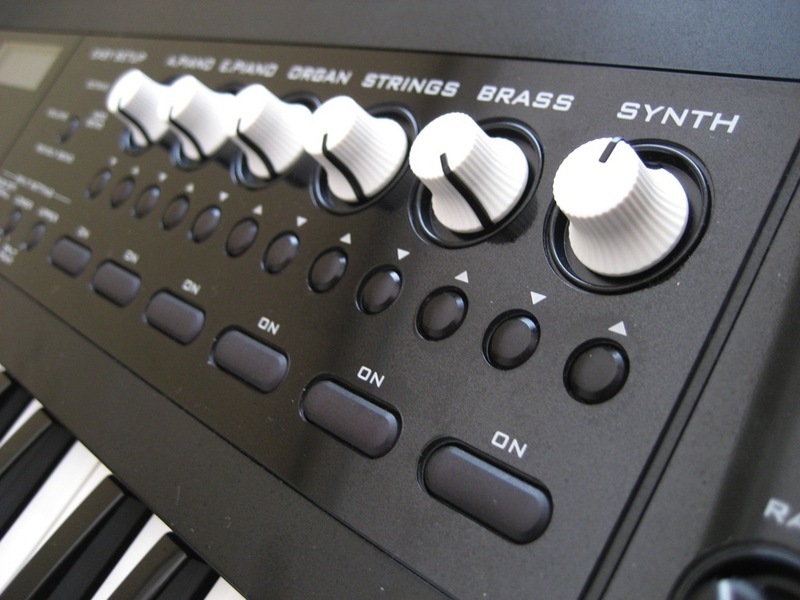 In order to do that you get six rotary controls, 12 program-change keys, six channel on/off keys, a quick-edit selector for four parameters (volume, octave and two FX sends), and a split control section. You can quickly stack six program layers. When you activate the split key, you get two sets of six layers on both sides of the split point. The six parts are sorted by category: acoustic piano, electric piano, organ, strings, brass, and synth. Further on to the right, you'll find nine controls and two keys that allow you to edit directly the two master effects and the global EQ to adapt the sound to the music. Once you are satisfied with the results you can save everything in no time. There's no need to say that the handling is very easy and practical. 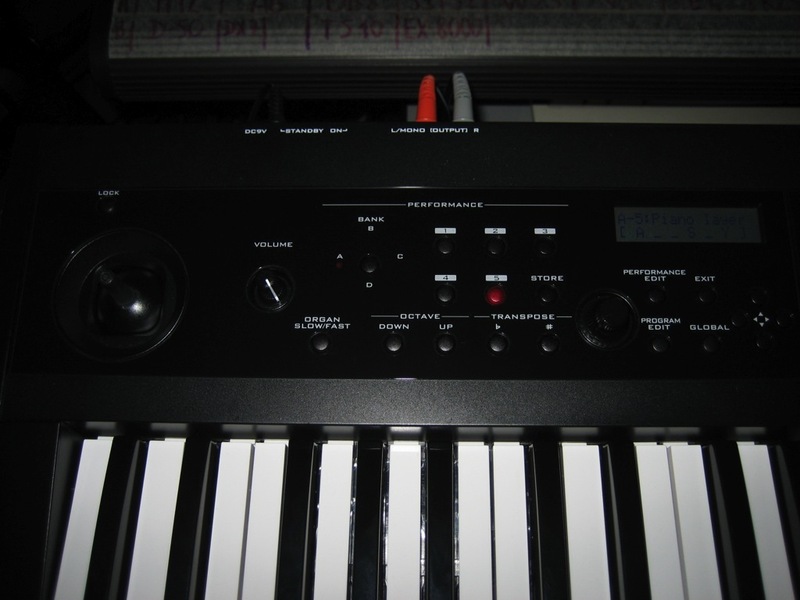 But as you will see later on, the PS60 is not only a spontaneous stage keyboard but also a really comprehensive synth. Now, let's take a quick look at the rather spartan rear panel: external PSU connector (normal for a low-budget product), on/off switch, stereo analog out, MIDI in/out, and a pair of multifunction foot controllers. Nothing revolutionary for today's standards... The minijack 1/8" headphones out is on the front panel. Nice! Let's close this short overview by noting that the five-octave keyboard is velocity sensitive but it doesn't support aftertouch, and it sports half-weighted keys with better quality than its competitors in the same price range. The PS60 uses a sound synthesis based on samples taken from the M3/M50 series in a compressed PCM ROM equivalent to 49 MB at 16 bits/48 kHz. You get 120 voices of polyphony and 12 simultaneous channels of multitimbrality. The unit always works in performance mode, which means that it always uses an arrangement of one or two sets with six sound layers. Each layer includes one of the 512 internal programs, including 440 factory-loaded ones. Each program includes a small demo to be chosen from 383 audition riffs which cannot be programmed. The sound samples provided with this review use these riffs to allow you to get a quick overview of the pop/rock oriented sound possibilities. You'll find some multisample acoustic pianos in different stereo variations (with or without sustain pedal and different tempered tunings) and a piano from the M1: typical sounds of older Korg workstation generations that cannot come close to the level of multisamples used by modern workstations. The multisample electric pianos sound much better, especially two Fender and one Wurlitzer sampled with three velocity steps. The Clavinet sounds are ok, especially thanks to the FX section. You get eight electric organs, which cover most music styles from smoky jazz to spellbinding gospel and distorted rock. The integration of the PS60 with a PC/Mac is done via the USB2 port, which deals with MIDI in/out data only. The device is provided with a software pack including drivers and a software editor available as standalone and also as VST/AU/RTAS plugin. You'll have to use the software editor to access the powerful sound synthesis engine of the device. The editor is also the only way to edit some basic functions that we would like to be able to control directly from the PS60 front panel. For example: multisample selection for the oscillators, filter type selection, LFO, envelope and modulations advanced editing, and insert effect editing. The editor software is well thought-out and pleasant to use. It provides a dual tab system for complex editing so you don't have to open multiple menu pages. Just like with the Triton and its successors, the program mode provides you with eight main tabs (basic, OSC, filter, amp, LFO, AMS, insert effects, master effects) plus a quick tab to edit various key parameters from one single page. In performance mode, each parameter page shows all six channels at the same time, allowing you to edit several layers simultaneously, which is not easy to do directly on the PS60 because you have to switch layers one by one. In short, the editor can come in really handy to prepare live gigs! Although handling is extremely simple, internal editing is not very easy with the small display and the four browsing keys. Menu pages are organized in several levels and you can get lost very quickly in spite of the small arrow icons. You can't access all program and performance parameters directly from the PS60. To access all details you have to use the software editor provided (see text box). Program editing shows that the sound architecture is almost the same as in an M3/M50 except for the drum kit editing, which is missing on the PS60. A program includes one or two "oscillator > filter > amp" layers. Each oscillator can use up to four mono or stereo multisamples with programmable crossfade. But you can neither select nor arrange the 136 multisamples in the PCM ROM from the PS60. A serious limitation that means you have to resort to the external software editor. The frequency can be modulated by the pitch envelope, two LFOs, the hardware controls, and MIDI control change messages. Each oscillator has its own pitch and velocity range. Afterwards, the signal is sent to the very powerful filter section with different configurations: four-pole low pass, two-pole multimode (low, high, band, rejection) in series or in parallel. The filters can be modulated (cutoff and resonance) with multiple modulation points, a dedicated envelope and a tracking generator. Access to the filters is also limited on the PS60. The signal is then processed by the amp section, which can also be modulated. 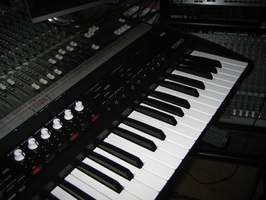 A program can include eight sound layers, four filters, five LFOs, five envelopes, four tracking generators, multiple modulations, keyboard portamento and temperament. To adjust insert effects you have to do it in program mode (see details below). The performance mode allows you to store the mix, the offset value of some synthesis parameters and the MIDI settings of two sets, including six sound layers. In split mode, you can use up to six layers on each side of the split point. The only problem is that you have only one point, which means you can adjust neither the pitch range nor the velocity window for each channel — which would be possible with a workstation. Thus, you cannot stack layers "uselessly." Each layer offers tone and timbre settings, starting with offsets of parameters adjusted in program mode: filter (cutoff, resonance, envelope intensity), velocity to amplitude and ADSR (common settings for both filter and amp envelopes). You also get volume, pan and two master FX send controls, but also pitch, portamento, pitch bend, and MIDI (channel, controller filter, local mode). This last feature makes the PS60 a very nice control keyboard. Why is it impossible to adjust the pitch range of each channel? All parameters can be edited internally or via the software editor provided. Regardless of the editing mode (internal or external), you can edit a program thoroughly in its performance context. When you push the [Edit] key, all six buttons of the active channels flash forcing the user to choose only one of them for editing. All other channels are muted and the program of the selected channel becomes available with a volume value of 127. This has been a serious limitation of Korg workstations since the M1, except for the 01/W that allowed you to edit a program within a multitimbral combination pressing specific keys (what a memory!). To finish up. you can store 20 performances, 15 of which are factory preloaded. It's certainly not much, even for an ergonomic stage keyboard that allows easy editing and remixing programs. The PS60 includes five insert multi-effects, two master effects and one master EQ taken directly from the M3/M50. Each channel has its own insert effect except for the strings section which only uses masters effects. Unlike the M3/M50, you cannot use all five insert effects in the same program. The insert effects are the most powerful regarding number of algorithms (64) and editable parameters (5 to 25). All parameters can be accessed from the software editor. You'll find different stereo dynamic processors (compressor, limiter, gate, exciter), EQ, wah-wah, filters, decimator, amp simulations, phaser, tremolo, and some effect combinations. Plus two vibrato/chorus and Leslie effects dedicated to the organ channel (remember that the strings channel has no insert effects). Some parameters can be modulated in real time with a freely selectable source from the main hardware or MIDI controllers. 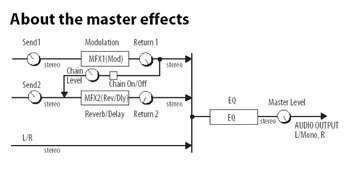 Apart from that, you get two stereo master effects with fewer parameters: one ensemble effect (four algorithms: chorus, flanger, vintage chorus/flanger, phaser) and reverb/delay (hall, plate, room, delay). Each of them offers three editable parameters, either from the front panel via the editor: rate, depth and feedback for the ensemble effect; time, feedback and level for the reverb/delay effect. 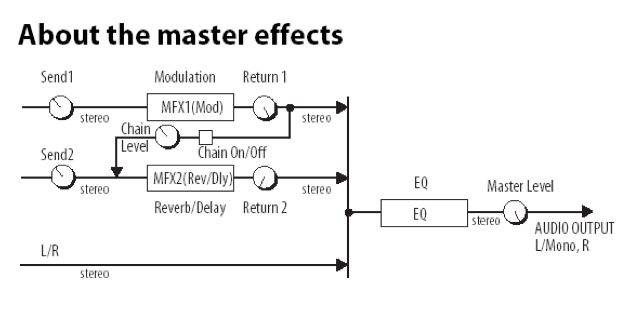 Both master effects can be routed in series or in parallel, being able to control the level of insertion from the first one in the second one. Finally, you get a global, fully parametric three-band EQ whose level parameters can be edited on the front panel, but all other parameters must be accessed from the menus and the editor software. The overall sound quality of this FX section is excellent. You can feel the knowhow of the manufacturer when it comes to integrating effects into a workstation. The PS60 offers an interesting concept at a very affordable price. You get a rather good pop/rock sound selection that, honestly speaking, cannot compete with big workstations or high-class stage keyboards. The same applies to the sound synthesis parameter set that requires an external piece of software (which is provided, luckily). One thing that sets the PS60 apart from all those high-end, sophisticated products is that it is clearly superior when it comes to quickly stacking, splitting, mixing and editing different sound layers during live performances. This will appeal to nomad musicians who want to avoid damaging their budget and their back!